Pretty girls and motorcycles go really well together, don’t they? Now, put art into it and you will have a combination hard to beat! 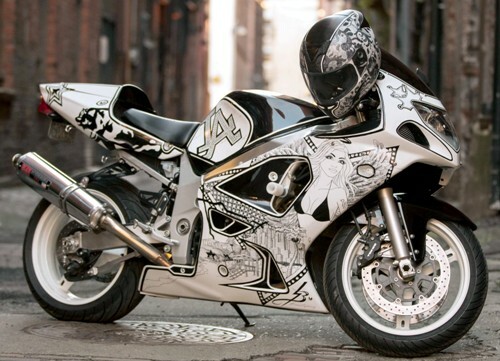 Meet Breece Knudson, an Interior Designer whose passion for motorcycles and art has led her to create one of the most unique designs ever on a bike. 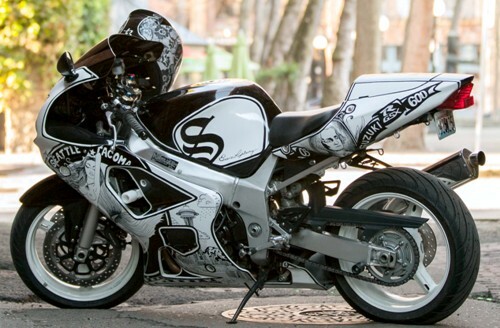 Breece's ride is a 2003 Suzuki GSXR 600. She bought it from a friend four years ago and, not happy with the original design, she came up with her own providing a fresh look for her bike. Art so original and so inspiring that you cannot help but stare at it and ask questions; the bike tells her story: Breece spent time living in the Pacific Northwest before moving to Los Angeles. She later moved back to the Seattle area. The sketches reflect her life in LA on the right side of the bike, and her life in the Puget Sound on the left. Breece is no regular girl; she is a sweetheart with a dark side, a duality that you can see and appreciate through each illustration on her bike. She did all of the illustrations for the first time using just her Sharpie, and even more impressive, it took her only 5 months to complete. To our pleasant surprise, when we asked her what her favorite design on the bike was, she answered without hesitation, it was the part that represents the Seattle-Tacoma area; including the Pacific Science Center and the Space Needle, because that’s where her roots are. This gorgeous Seattleite has no tattoos, as expected from the stereotypical view of a rider; all the drawings that can possibly represent her are beautifully Sharpied on the bike, as she explains. Such art should be known and shown in the motorcycle world, and Breece’s bike is certainly there. 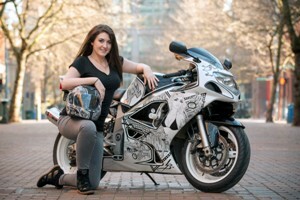 She has had the opportunity to attend numerous events in the motorcycle and automobile industry, presenting her bike and design with a clear success. She has a Facebook fan page reaching almost 400 followers and a bunch of invitations to events involved in the motorcycle world. For Breece, all of this wouldn’t have been possible without her partner’s help. 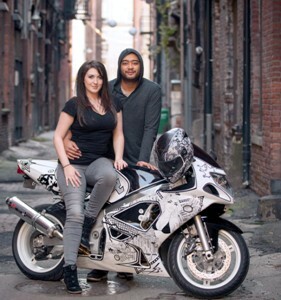 Matthew’s support plays an important role in this busy motorcycle world and his presence is a motivation for her. Good news for fans who are interested in Breece’s work: she also works on other motorcycles, not necessarily in the black and white Sharpie technique. As a good artist, she also uses several sources and a variety of colors; it all depends on the clients needs. Her signature technique when designing and painting is to tell a story more than just showing off her artistic skills. She puts personality into each bike she works with. Breece’s plans for the future are full of events, a ride through the west coast, invitations to shows in the Midwest and more. If you want to keep up with this local artist and get to know more about her work, we invite you to follow her Facebook fan page www.facebook.com/thesharpiebike. You can comment, support and cheer for her stunning work.